College students are certain to have times during their academic careers when they need instant feedback on homework, assistance grasping concepts, or a few more hours of practice to decipher laboratory results. Four of the 2015-2016 DELTA Grants projects worked to provide solutions for students who want to help themselves. DELTA teams created applications and media-rich interactive devices to promote learning outside of the class or lab. The DELTA Grants projects aimed to facilitate more touchpoints for students and provide more feedback before they are tested on material. One way to provide more one-on-one assistance to students is through online applications. These apps allow for feedback to students who may not have sought help at a tutorial center or from a teaching assistant. Two results developed this year by creating additional feedback for students in a more efficient manner. Allowing for more touchpoints for students to check their understanding or validate their results is a great benefit for learning outcomes as well as helping a percentage of students who may not have sought personalized help. One course solution involved creating a smart phone app to allow students to use equipment they are comfortable with to test physics concepts. Another outcome was to take information once presented as a one-way street via videos and incorporate the content into modules, which include interactive, media-rich graphics, animations, and a soil sample visualization. Realizing students cannot always make it to the brick and mortar physics center during staffed hours, Zachary Lewis sought a DELTA Grant to create an online tutorial database system called Virtual Physics Tutorial Center (vPTC). 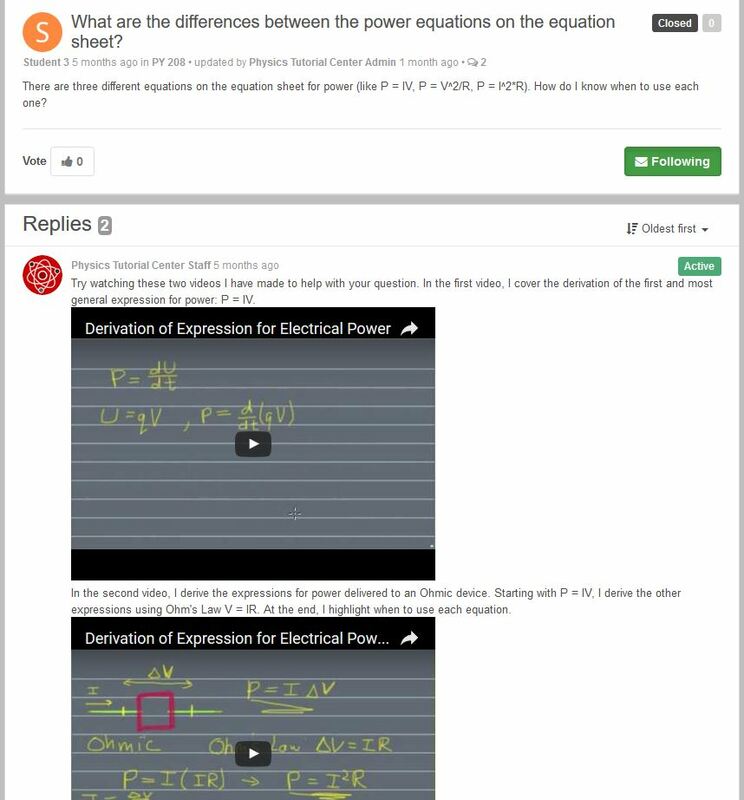 Through vPTC, an online interactive physics tutorial center, students can learn new material and receive feedback without making the trek to the on-campus center. An application was repurposed to create a ticketing system to rank the most popular questions. Students log in and search the database for answers to their questions. The system provides students with text and/or video explanations of physics concepts. If the student still has a question after reviewing the existing material they can submit a question to the system, and there is no limit on the number of questions that may be asked. Since it is a ticketed system, the most popular answer is rated and moves up as a ‘best resource’ for other students to use. This interactive system may be reused by other university departments, an important characteristic to Davis and Lewis. “We design with universality in mind — to create in such a way that others might benefit from it as well. We are always thinking about how to maximize our impact,” said Davis. Lewis also said he hopes more students, departments and universities will be able to use the service in the future. Lewis said working with the DELTA team exceeded his expectations, which were already high based on discussions with other physics faculty members that had worked with DELTA. “Every member of the team has been essential in the development, testing, launch and ongoing maintenance and improvement of this service,” he said. For Dr. Laura Gray Tateosian, who teaches the Python programming language as part of her Geospatial Information Science and Technology course, her instructional challenge was helping students learn problem solving for code development. “We wanted to address this [issue] by providing feedback in a low-stakes (non-graded) environment before students submit their assignments for grading. In an ideal world, an instructor would watch over each student’s shoulder as he or she writes each homework script. In the real world, the only way to make this sustainable is to automate the process,” Tateosian said. One struggle for students was making errors in their homework that caused them to have coding issues. 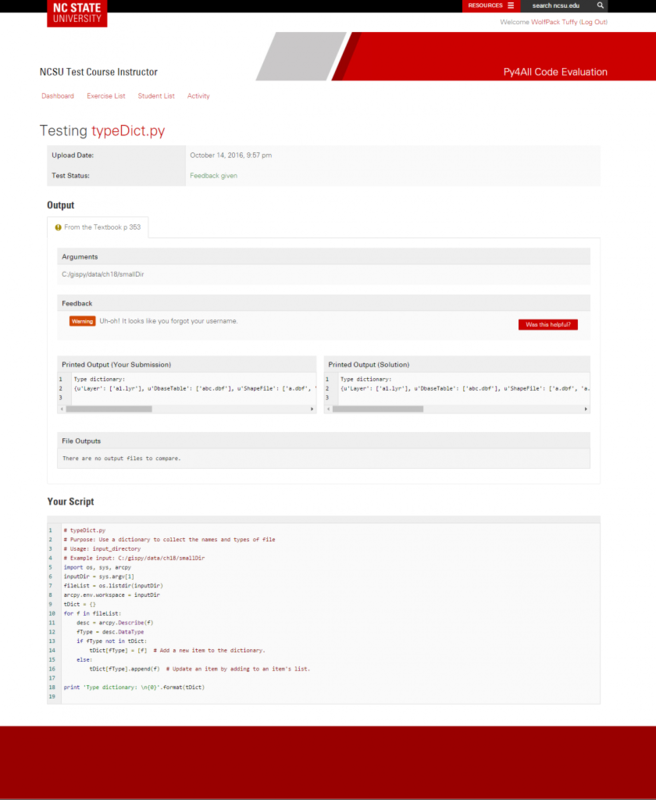 The DELTA Grants team used Tateosian’s existing grader scripts as the basis for a new web application to enable students to upload their Python scripts and receive nearly instant feedback on issues in the code. The program flags portions of the submitted script as green, yellow, orange or red, indicating the level of issues within the programming. This information is vital for students to receive prior to uploading their final projects. Py4All was deployed in Fall 2016. Students are able to use the application with less oversight while receiving vital feedback to improve their programs. 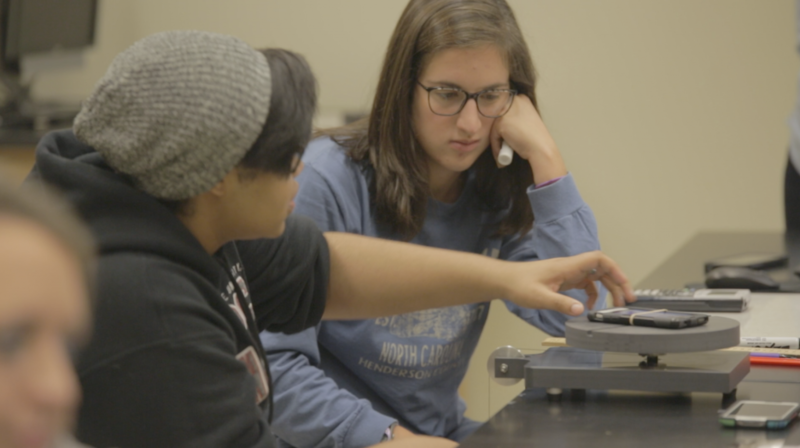 Replacing expensive equipment that is difficult to read in physics labs is what led Teaching Assistant Professor Dr. Colleen Countryman to seek DELTA’s assistance in developing a free mobile app for her students to conduct experiments. While a graduate teaching assistant, Countryman received an initial exploratory DELTA Grant in the 2014-2015 cycle. A DELTA team assembled to create the mobile app, which used focus groups and testing to inform the development of the final product. In 2015-2016 the grant was extended to conduct research and tweak the app based on feedback. According to Countryman, the familiarity with smartphones plays a large part in the popularity of the app. “When students used similar apps in our studies before the development of the MyTech app, they were incapable of explaining the intricacies of how their sensors collected data. With the MyTech app’s built-in transparency and a curriculum that directly integrates these features, students were able to provide detailed explanations of these mechanisms at the level of advanced physics students,” said Countryman. “Using our own survey instruments, we were also able to determine students’ understanding of how the sensors collect data improved and, in fact, exceeds the expectations of introductory physics students set forth by the American Association of Physics Teachers,” she added. Countryman said initial survey data indicated students enjoyed working with the app and felt it was better than the alternative. The free MyTech app was implemented last year and is available on Google Play and Apple Store. “Not often do we get to affect change beyond the boundaries of NC State,” said Davis. Lecturer Mr. Lee Ivy inherited a course comprising a collection of 73 videos and 10-15 assignments in 2012 when he was hired. He described the process as intimidating and painstaking. “I had never torn a course apart and examined all of the reasons why, all the ways how and all the methodologies and inspirations behind activities, said Ivy. “It was challenging but very rewarding,” he added. At the end of the first year, the DELTA team, led by Cathi Dunnagan, developed a solid framework for the course. “I had the ownership I craved,” Ivy said. Excited to implement some of the media-rich solutions discussed during the 2014-2015 cycle when the course was revamped, Ivy applied for an exploratory grant during the 2015-2016 cycle. According to Dunnagan, the course was redesigned into modules. There is a prominent graphic in Moodle that builds out as students complete modules, giving them a sense of how far along they are in creating their home garden. “We are encouraging the students to get their hands dirty,” said Ivy. This second grant allowed for the creation of animations to better explain complex concepts and to inspire students to compare real horticulture environments. One of the new module activities is a 3-D soil sampling component. Students use this game-like feature to visualize the landscape site, learn how to properly take soil samples and calculate chemical and physical soil amendments. “Again, it will inform while inspiring them to participate in an outdoor horticultural environment,” Ivy added. Based on student evaluations, course participants have responded well to the layout and production methods in the videos. The numbers greatly improved after the first grant cycle and Ivy expects the new additions to the course implemented this fall will receive good reviews as well. The PRATT (Photosynthesis, Respiration, Absorption, Transpiration, Translocation) animation will be rolled out Fall 2016. The design of this animation is to graphically explain five complicated processes every plant experiences. It is a critical learning piece for the course that students have struggled to grasp. “Cathi [Dunnagan], Ben [Huckaby], Chrissie [van Hoever] and Meg [Snyder] made this process very enjoyable due to their expertise, excitement and creativity. I recommend DELTA grants to as many as are interested in expanding their teaching capabilities,” added Ivy. These four DELTA Grant projects from the 2015-2016 cycle have met students on platforms they are already familiar with. By recognizing instructional challenges, faculty members have partnered with DELTA to adjust their courses to help students succeed by giving them the ability to access information and receive assistance in a timely manner.